What was the most significant innovation of Thomas Edison? Some may say it was the distribution of electricity and incandescent lamp. Others may say it was the phonograph. I belong to Henry Ford club who believed that his method of innovation was as significant a contribution as his direct contributions such as lamp, phonograph etc. Let’s look at Edison’s method of innovation briefly through an example of electric distribution system. 1. Establish the need: In the summer of 1878, Thomas Edison was watching a gang of miners drilling for ore with heavy tools when he was seized by a vision – the idea of energy moving as electricity over a long distance. 2. Find anchors to hang your imagination: In the same year (1878), Prof. Barker of University of Pennsylvania suggested to Edison that he should subdivide the electric light so it could be got like small units like gas. Coal gas industry was an established industry by then supplying gas to homes and streets through underground pipes (e.g. see Austin’s coal gas plant which arrived in the city in 1873). Prof. Barker’s analogy provided a useful anchor for Edison. Around the same time, Edison visited the workshop of William Wallace and saw a generator system they had built to power their arc lamps – eight of them, in a row, all at once. Edison reported to New York Sun after a month, “I saw for the first time everything in practical operation. It saw that the thing had gone so far but that I had a chance. The intense light had not been subdivided so that it could be brought into private house”. 3. Know the known: Henry Ford writes Edison saying, “I started my usual course of collecting every kind of data. This time it was about gas: I bought all the transactions of the gas-engineering societies, et cetera, all the back volumes of gas journals, et cetera. Having obtained all the data, and investigated gas jet distribution in New York by actual observations, I made up my mind that the problem of the subdivision of the electric current could be solved and made commercial.” When Edison decided to focus on electricity project, he suspended the phonograph project. 4. Establish goals & use-cases: Edison established top two requirements as follows: "I realized that an electric lamp to be commercially practical must of necessity bear a general comparison with a gas jet in at least two points: first, that it must give a moderate illumination, and, second, that such a lamp must be so devised that each one could be lighted and extinguished separately and independently of any others. With this basic idea in mind we resumed our experiments at once”. Subsequently he wrote an 8-point memo that articulated requirements and use-cases of the entire electricity distribution system (see page 20, Henry Ford). 5. Iterate over experiments: Edison says, “When I am after a result that I have in mind, I may make hundreds or thousands of experiments out of which there may be one that promises results in the right direction. This I follow to its legitimate conclusion, discarding the others, and usually get what I am after.” In this case, he assigned the lamp experiments to his assistants Upton and Batchelor. 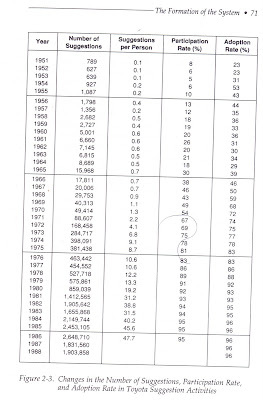 Every experiment used to have a number. For storage batteries, Edison ran 5 series each with 10,000 experiments. 6. Demonstrate prototypes to stakeholders: Between October and December 1879 hundreds of carbon lamps were made and put into use not only in his lab but also on the streets and several residences at Menlo Park. On December 31, 1879, Edison and his gang made a public demonstration of his incandescent light bulb at Menlo Park. Special trains were run to Menlo Park by the Pennsylvania Railroad, and over three thousand people attended the demo (including public officials, financers, journalists etc). 8. Manage a portfolio: Edison always managed a portfolio of projects. For example, during 1880 to 1885, the peak of his lamp and distribution system project, he also filed patents related to magnetic ore separation, secondary batteries, telegraph and telephones and electric railway. His secretary estimated that in 1890 he was engaged in 72 different projects. Source: Edison as I know him by Henry Ford. 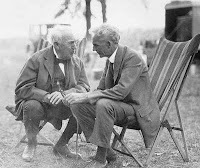 Meeting with Thomas Edison on 11th August 1896 and hearing his words of encouragement was a turning point in the life of Henry Ford, the founder of Ford Motor Company. In 1890s Edison, pursuing electric cars, telling young Ford that gasoline cars hold more promise than electric cars was like Ken Olsen of DEC telling Steve Jobs that PCs hold more promise than mini computers in the 70s. How did Edison manage to see beyond electricity? Let’s explore this in this article. In 1896, Henry Ford was working as a Chief Engineer with Detroit Edison Company with a salary of $125 a month. His boss Alex Dow approved of experimentation but did not like gas experiments. Ford mentions Alex saying, “Electricity, yes, that's the coming thing. But gas--no." It was a time when – as Ford recalls - all the electrical engineers took it as an established fact that there could be nothing new and worth while that did not run by electricity! It was to be the universal power. Edison, of course, was the torch-bearer of this universal power. It is in this context that Ford met Edison when Ford and Alex went to attend annual convention of all Edison companies at Manhattan Beach Hotel. "Is it a four-cycle engine?" he asked. I told him that it was, and he nodded approval. Then he wanted to know if I exploded the gas in the cylinder by electricity and. whether I did it by a contact or by a spark—for that was before spark plugs had been invented. I told him that it was a make-and-break contact that was bumped apart by the piston, and I drew a diagram for him of the whole contact arrangement which I had on my first car—the one that Mr. Dow had seen. But I said that on the second car, on which I was then working, I had made what we today would call a spark plug—it was really an insulating plug with a make-and-break mechanism—using washers of mica. I drew that too. He said that a spark would give a much surer ignition and a contact. He asked me no end of details and I sketched everything for him, for I have always found that I could convey an idea quicker by sketching than by just describing it. When I had finished, he brought his fist down on the table with a bang and said: "Young man, that's the thing; you have it. Keep at it. Electric cars must keep near to power stations. The storage battery is too heavy. Steam cars won't do either, for they have to have a boiler and fire. Your car is self-contained—carries its own power plant— no fire, no boiler, no smoke and no steam. You have the thing. Keep at it." I find four things interesting in this story: (1) How most people get blinded by the technology-of-the-day (like Ford’s boss Alex) (2) Alex introducing Ford to Edison in spite of his grudge (3) The details into which Edison went questioning Ford (4) Edison’s ability to appreciate an underdog technology. Ford quit his job on August 15, 1899, and went into the automobile business. Ford and Edison became lifelong friends. Sources: Edison as I know him by Henry Ford and My life my work, Henry Ford’s autobiography. I consider Thomas Edison the father of “systematic innovation”. Edison founded the first industrial research laboratory in Menlo Park in 1876 which he named “Invention Factory”. However, in today’s context, the name is a misnomer. What Edison started was actually an “innovation factory”. In the next few articles I will articulate my understanding of how Edison’s innovation factory worked. Let me start with a few of his quotes which I like and which I believe depict underlying principles of his method of innovation. 1. Anything that won't sell, I don't want to invent. Its sale is proof of utility and utility is success: This shows that Edison was first an innovator and then an inventor. Utility i.e. practical value of the things produced was of high importance to Edison. He used inventions and patents as a means to protect his product’s position from competition. As it turned out, patents alone are not the best form of competitive advantage. His biographers Dyer and Martin write - Edison confesses that he has never made a cent out of his patents in electric light and power—in fact, that they have been an expense to him. However, I believe that the 12,000 odd shares he got in General Electric after the merger of Edison General Electric and Thomson Houston in 1892 does indirectly show the value he received for his patents. 2. Great ideas originate in the muscles: Edison believed that experimentation was at the heart of innovation process. Ideas by themselves do not mean much. In fact, more refined ideas come about when you start experimenting with the ideas in crude form. Experimentation is hard work and perhaps that is why Edison said this. 3. Hell, there are no rules here. We are trying to accomplish something: Edison called his workers “muckers” – a word borrowed from British working class and meant “to fool around”. Similar to 3M, which called its innovators, “tinkerers”. Edison would set the broad direction of the experiments and assign it to a “gang” (his term). However, the “muckers” would “fool around” with the parameters the way they liked. 4. I have not failed. I just found 10,000 ways that won’t work: Edison distinguished between negative result of an experiment and failed experiment. Every new negative result means a new learning about what doesn’t work in what context. Edison would number all his experiments. For example, in the spring of 1884, he supervised 2,774 lamp experiments at Menlo Park. 6. To invent, you need a good imagination and a pile of junk: As mentioned in the wikipedia, Edison’s laboratory had "eight thousand kinds of chemicals, every kind of screw made, every size of needle, every kind of cord or wire, hair of humans, horses, hogs, cows, rabbits, goats, minx, camels ...silk in every texture, cocoons, various kinds of hoofs, shark's teeth, deer horns, tortoise shell ...cork, resin, varnish and oil, ostrich feathers, a peacock's tail, jet, amber, rubber, all ores ..." and the list goes on. Does your office have any pile of junk? There are many ways to slice innovation. In this article we look at one such way which BusinessWeek uses while listing its 50 Most innovative companies. For example, it says that Apple is a product innovator, while Google is a customer experience innovator; IBM is a process innovator etc. This classification can help us answer questions like: What are we innovating around? How many levers are we turning? · Process innovation: If Coffee Café Day uses a new and perhaps faster machine to make cappuccino, it is changing an internal process. Process innovation involves changing internal business processes and making them more efficient. 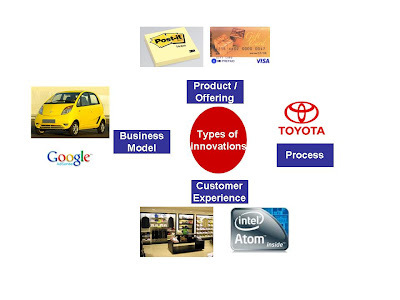 Toyota is considered the role model of process innovation through its “continuous improvement” or “kaizan” methodology. · Product/Offering innovation: When 3M offers Post-It notes or when SBI offers a new type of card called SBI gift card, it would be a product/offering innovation. It is about providing a new product or service to customers. · Customer experience innovation: When a retail shop re-arranges the layout in its stores or when Intel runs an “Intel Atom inside” advertising campaign, they are trying to change customer experience. Visual merchandizing is a discipline that focuses on customer experience innovation in retail industry. Innovating a brand would fall under type of innovation. · Business model innovation: When a company re-configures a value-chain by (a) creating a new customer and/or (b) by creating or eliminating a channel and/or (c) by re-defining a pricing model, it is doing a business model innovation. Tata Nano created a new customer (offering 4-wheeler to 2-wheeler owner). UFO Moviez eliminated the movie distributor in the value-chain. Google’s AdSense created a new way of monetizing Internet search. In many organizations, these types of innovations happen in different departments. For example, delivery or product departments operationalize process innovation. New Product Development (NPD) or Business Development (BD) or Portfolio Management departments work on product/offering innovations. Brand managers work with customer experience innovations. Business model innovations are usually with strategy departments. Many of these departments speak their own language and usually don’t talk to the other innovators. It would be interesting to get a few representatives in a single room and see what concoction happens. Last week I facilitated a workshop Future-proofing: Making innovation engine fire and sustain held at Royal Orchid Park Plaza, Bangalore. We had 14 leaders from 9 organizations exploring together the topic of systematic innovation and how it can be operationalized. How to create an environment of innovation? Are there any systematic steps for innovation? How do we predict timing of ideas? How to identify innovative people? We tried out Pain-Wave-Waste technique of sourcing ideas and we looked at how big ideas come about e.g. we looked at a story of creating a prepared mind and asked a question: Can we cook big ideas systematically? We looked at AdSense story and explored how we can bring experimentation to the heart of the innovation process. We looked at 4 types of risks every innovator should be aware of and how we can apply cost-impact matrix to select ideas. Finally, we also looked at how we can systematically create innovation sandboxes (additional examples: dynamic innovation sandbox, Tata Nano through sandbox lens). At the end, we felt that each of us could start with a few steps in our respective organizations and make some progress step-by-step.